The following import/export categories include motor buses, coaches, trolley buses and gyrobuses. The U.S. Department of Commerce, Economics and Statistics Administration, U.S. Census Bureau trade figures for January 2019 indicated vehicle imports were up in four categories outlined, compared to January 2018. The United States imported 157 vehicles in January 2019, down 9 percent from 173 vehicles imported in January 2018. Canada sent 58 vehicles to the United States during January 2019, while Mexico exported 47 and Macedonia shipped 43. The average price per vehicle for January 2019 was $379,197.70, down 6 percent from the average price for January 2018 of $405,115.76. The United States received 158 vehicles from Germany in January 2019. There were no vehicles imported during January 2018. The average price of the vehicles for January 2019 was $41,596.70. No vehicles in this category were imported during January 2019 or January 2018. The United States imported two vehicles from Canada during January 2019 at an average price of $15,299. There were no vehicles imported during January 2018. There were no vehicles imported during January 2019 and January 2018. The United States imported seven vehicles during January 2019 at an average price of $178,000. There were no vehicles imported during January 2018. The United States imported seven vehicles from China during January 2019, at an average price of $7,489.71. There were no vehicles imported during January 2018. The United States imported 60 vehicles during January 2019, the same as for January 2018. Canada sent 57 vehicles to the United States during January 2019. The average price per vehicle for January 2019 was $67,161.52, up less than 1 percent from $66,953.30 for January 2018. The United States imported 55 vehicles during January 2019, down 78 percent from 249 during January 2018. Canada sent 32 vehicles to the United States during January 2019, while Germany exported 21 vehicles. The average price per vehicle for January 2019 was $43,531.42, down 11 percent from $49,124.95 for January 2018. Export totals for January 2019 were up in three categories, compared to January 2018. The United States exported 363 vehicles during January 2019, down 37 percent from 579 vehicles exported in January 2018. Canada received 196 vehicles during January 2019, while Mexico imported 104. The average price per vehicle for January 2019 was $58,760.63, down 30 percent from the average price for January 2018 of $83,876.86. The United States shipped 282 vehicles in January 2019, compared to four vehicles for January 2018. Canada received 264 vehicles during January 2019. The average price per vehicle for January 2019 was $28,422.24, up 542 percent from the average price for January 2018 of $4,424.50. The United States exported 19 vehicles in January 2019, up 111 percent from nine vehicles for January 2018. Mexico received nine vehicles during January 2019. The average price per vehicle for January 2019 was $24,205.95, up 9 percent from the average price for January 2018 of $22,290. The United States shipped two vehicles in January 2019, up 100 percent from one vehicle for January 2018. Canada and Ecuador received one vehicle each during January 2019. The average price of the vehicles for January 2019 was $30,203.50, down 45 percent from the price for January 2018 of $55,000. Complete Coach Works now offers an optional 466 kWh onboard energy storage system. “CCW increased its Zero Emission Propulsion System (ZEPS) battery pack in order to increase power and range. Currently, there are more than 50 ZEPS buses deployed in service across the nation with over 3 million revenue miles. These deployments have been proven to perform successfully in all types of weather conditions,” according to a press release. IndyGo and Indy Airport operate 30 ZEPS buses for its day-to-day operations. The city of McAllen Transit Department utilizes two ZEPS buses to operate out of the city’s International Transit Terminal, where passengers can connect for several international, national, regional and intercity destinations. Brad Carson, CCW’s director of sales and marketing, said, “The increase in energy capacity is exciting for this technology. We were able to keep the battery pack light which improves vehicle reliability and efficiency. Our company is committed to providing the transit industry with the most advanced technology, and this upgrade will give agencies the extended range they need on a single charge. According to the release, the ZEPS saga started as an option to provide customers a clean, cost-effective, and viable alternative to fossil fuel. Working with its sister company Transit Sales International, CCW developed its own system by taking an existing low floor transit bus and rebuilt it as a battery electric bus. 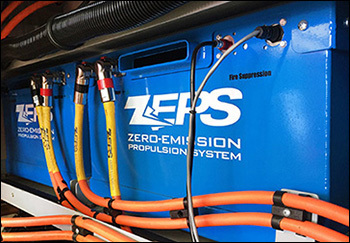 The resulting ZEPS bus offers economical options to bus operators looking to start an electric bus operation. Operators can opt to purchase newly refurbished buses from CCW’s inventory or have their existing fleet converted to all-electric. Complete Coach Works (CCW) has been awarded a contract with Orange County Transportation Authority (OCTA) to furnish and install up to 484 three-position bike racks and 73 spare units. According to a press release, “Alternative modes of transportation have become popular in order to decrease automobile use and reduce emissions. To keep up with this growing trend, municipalities are changing infrastructure to better accommodate cyclists. By upgrading to a three-position bike rack, OCTA will be able to offer more rack space to cyclists interested in using public transportation to supplement its commute. For more information, visit www.completecoach.com. 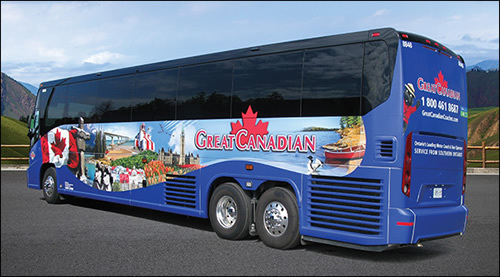 Motor Coach Industries (MCI), a U.S. subsidiary of NFI Group Inc., (NFI) said that Great Canadian Holiday and Coaches has added five MCI J4500 coaches to its growing fleet. The Kitchener, Ontario-based tour provider, part of the Trailways charter bus network, added two 2018 MCI J4500s last September, and is taking delivery of three all-new 2019 models this month. “With a major redesign in model year 2018, Great Canadian’s newest 56-seat coaches now feature MCI’s legroom, three-point passenger seatbelts, a new driver dash with a high definition instrument panel and enhanced lighting throughout. A new-for-2019 swing-out electric e-fan cooling package simplifies roadside engine access, improves fuel-efficiency and speeds maintenance on Great Canadian’s upcoming delivery,” according to MCI. Great Canadian has added power outlets at each seat, Wi-Fi connectivity, and MCI’s variable color interior lighting package to welcome groups with their chosen branding. “MCI assigns a team to each customer, coordinating its sale, field service and parts needs throughout the life of each coach. It’s a seamless model aimed at ensuring customer satisfaction and a long relationship with MCI,” said the company. Founded in 1984 by owners Larry and Lorna Hundt, the company began as Travel Ventures, and changed its name to Great Canadian Holidays and Coaches in 1998. After the 1995 Quebec referendum, the company dedicated each of its coaches with decals and air brushed images depicting a variety of Canadian themes. The company’s tour business offers a range of services from short day trips to an annual 23-day spring trip to California, that includes overnight stays and stops at notable destinations along the way. For more information, visit www.greatcanadianholidays.com and www.mcicoach.com. BYD (Build Your Dreams) has produced its 300th bus in its Lancaster, CA, manufacturing plant. BYD is celebrating the milestone with its customer and neighbor, Antelope Valley Transit Authority. AVTA is closing in on a landmark of its own — 1 million miles of zero-emission bus operations. AVTA expects to make that breakthrough in early May. The 300th bus is a 35-foot BYD K9S model transit bus. The vehicle is one of three built for Baton Rouge’s Capital Area Transit System (CATS). The agency will field test the use of electric buses in Baton Rouge, and study how the battery electric buses can be used on routes in Louisiana’s capital. 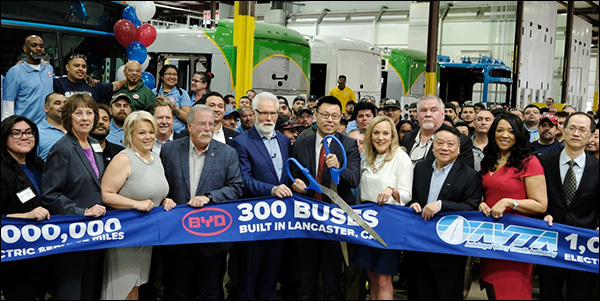 When BYD opened its Lancaster manufacturing plant in 2013, it had a handful of employees working on 10 buses in a 106,000-square-foot building that once housed a motor home manufacturing facility. “In six years, BYD has grown to become the largest battery electric bus manufacturer in North America, with more than 750 employees. Since acquiring the facility, BYD has increased its manufacturing plant to over one-half million square feet, with the capacity to produce as many as 1,500 buses a year. From one bus model under production in 2013, BYD’s product line has expanded to include 12 models. The transit bus line ranges from 30-foot K7 to the 60-foot K11, and the coach line ranges from 23-foot C6 to the double-deck, 45-foot C10MS. Silicon Valley workers will soon have a new custom-built HEPA filtration system that will be installed on a special-order Van Hool TDX high-capacity, double-deck coach. “The new feature is the culmination of years of collaboration between ABC and Van Hool to create a custom solution that improves interior cabin air quality on the 45-foot double-deck coach,” according to a press release. “Our advanced Van Hool TDX model meets and exceeds EPA 16, GHG 17 emission standards for commercial vehicles, so integrating new technology that can further enhance the passenger environment is exciting for our team,” said Roman Cornell, president/CCO at ABC Companies. “Involving customers in the process from inception, including the design phase, is critical to developing successful and innovative offerings that meet their needs and strengthen our relationships. “While indoor air quality is important for the operation of any business, bringing HEPA filtration technology to a mobile environment is the next step for passenger comfort,” said Cornell. “On both sides of the Atlantic, ABC and Van Hool pooled their expertise and resources to source and build a customized system that utilizes cutting-edge HEPA filtration technology. Together with the Van Hool engineering team, the ABC technical department worked closely to specify and fabricate a working prototype to be utilized within its NorCal-based customers’ employee-shuttle fleet operation. “Confined space and weight limitations were key challenges to product development, mandating a compact design that located the new HEPA system under-floor in a small portion of the baggage bay area, without compromising existing passenger cabin dimensions,” said Brian Nelson, engineering manager at ABC’s Winter Garden, FL, facility. According to ABC, the HEPA filtration unit is equipped with a HEPA filter, two pre-filters and two evaporator blowers that draw outside air through the filters, which is then transferred to the TDX lower deck A/C unit where it is circulated throughout the interior of the coach. The new system is designed to offer a significant reduction in particle counts down to the smallest concentration with results being achieved within 20 minutes of operation. Conclusive testing revealed decreased dust in the interior cabin. Supporting data indicated a substantial drop in measurements in the following test ranges: Particles up to 0.3 um dropped from 2,500 to 500 in 20 minutes; Particles up to 0.5 um dropped from 1,000 to 180 in 20 minutes; and, particles up to 1 um dropped from 350 to 70 in 20 minutes. In maintenance and equipment performance, Tom Van Lokeren, engineering bus and coach HVAC specialist at Van Hool, said that HEPA filtration technology can contribute to optimal equipment performance by helping to maintain a cleaner coil, so that other components like fans, and filters can operate at nominal conditions as designed, and potentially extend the service life of HVAC components. According to the press release, ABC also offers the patented UV-C Disinfectant system for coaches. The Fresh-Aire UV® System offers heavy-duty germicidal UV technology inside a coach’s HVAC system, which inhibits the growth of mold and destroys up to 99 percent of microbial contaminants within one hour. The chemical-free purification technology is the same that is used in hospitals, laboratories and the food industry to prevent the spread of airborne infectious bacteria. The Fresh-Aire UV® System is available from ABC, and is easily installed. For more information, visit www.abc-companies.com.